Baton Rouge, La – The Southern University Agricultural Research and Extension Center has been awarded a three-year, $1.5 million grant that will provide economic recovery and revitalization of communities that suffered damage as a result of Hurricanes Gustav and Ike. The majority of the grant - $1,002, 149.03, which was funded by the Louisiana Division of Administration’s Office of Community Development, Disaster Recovery Unit, will provide dedicated funding for the purchase of a high tech, state of the art mobile education and technology unit that the Center will use to provide educational training, bring Interact access, hands on testing and live instruction to low-to-moderate income families residing in the most marginalized areas and remote corners of the state. The program, named Enhancing Capacity of Louisiana’s Small Farms & Businesses, will provide four certification courses in the areas of: Small Ag Business Development; Small Ruminant Production; Food Safety and Sustainable Urban Agriculture to the residents of the 53 parishes declared as federal disaster areas after the storms. According to the ‘Economic Impact of Hurricanes Gustav and Ike on Louisiana,’ report released by the Louisiana Department of Economic Development, the financial impact of both storms was between $10 - $20 billion, affecting approximately 97,000 businesses and small farms. Data from the LSU AgCenter estimates the losses to the Louisiana agricultural industries to be $1.1 billion in total impact and $5.32 billion in aggregate farm gate value. “The SU Ag Center will use the funding to expand and in some cases develop new educational programs to enhance the knowledge base of small farmers in communities impacted by the hurricanes,” said Dawn Mellion-Patin, project director of the program and Agricultural Specialist at the Center. “These citizens have suffered so much and for so long. The Southern University Ag Center has a long withstanding tradition of working with marginalized audiences and this effort is a perfect complement to our current efforts while broadening our reach statewide,” added Patin. With a report from the Louisiana Association of United Ways stating that 40 percent of Louisiana’s households either fall into the class of the working poor or are in poverty; this program hopes to open new avenues of delivery, instruction, production and markets through its various certification courses to end the economic struggles of the state’s poverty stricken parishes. 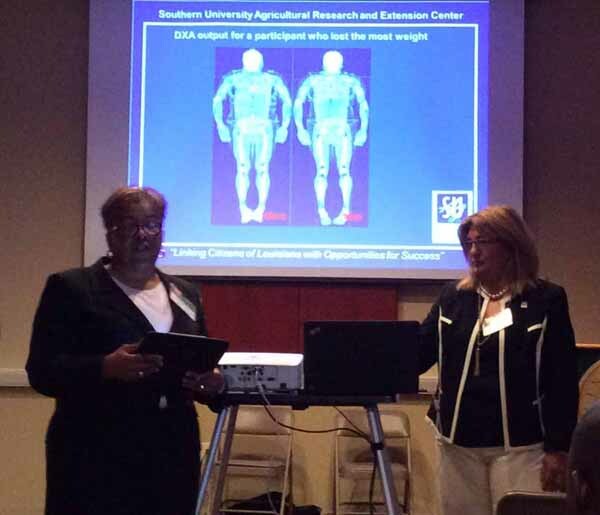 “This funding will allow the SU Ag Center’s researchers and specialists an opportunity to take research-based information into communities to citizens and address the needs as voiced by the underserved,” said Gina E. Eubanks, the Center’s Vice Chancellor for Extension. Hurricane Gustav made landfall near Cocodrie, Louisiana on Sept. 1, 2008 as a category 2 storm with peak winds of over 90 miles per hour. Ike made landfall only 12 days later on Sept. 13, 2008, as a category 2 hurricane near Galveston, TX with maximum sustained winds of 110 miles per hour. Acadia Parish, Allen Parish, Ascension Parish, Assumption Parish, Avoyelles Parish, Beauregard Parish, Calcasieu Parish, Cameron Parish, Catahoula Parish, Concordia Parish, East Baton Rouge Parish, East Carroll Parish, East Feliciana Parish, Evangeline Parish, Franklin Parish, Grant Parish, Iberia Parish, Iberville Parish, Jefferson Davis Parish, Jefferson Parish, La Salle Parish, Lafayette Parish, Lafourche Parish, Livingston Parish, Madison Parish, Morehouse Parish, Orleans Parish, Ouachita Parish, Plaquemines Parish, Pointe Coupee Parish, Rapides Parish, Richland Parish, Sabine Parish, Saint Bernard Parish, Saint Charles Parish, Saint Helena Parish, Saint James Parish, Saint John the Baptist Parish, Saint Landry Parish, Saint Martin Parish, Saint Mary Parish, Saint Tammany Parish, Tangipahoa Parish, Tensas Parish, Terrebonne Parish, Union Parish, Vermilion Parish, Vernon Parish, Washington Parish, West Baton Rouge Parish, West Carroll Parish, West Feliciana Parish and Winn Parish. “At the conclusion of this project, we expect that Louisiana's most marginalized small farmers and agricultural business owners will have the opportunity to increase incomes and expand their businesses and farms. Ultimately we expect Louisiana's small farmers and agricultural businesses to move from being at crisis levels to experiencing long-term sustainability,” said Patin. Baton Rouge, La. – The Southern University Ag Center’s Communities of Color Network (CoC), led the charge in Louisiana as the Southern University System became the first University System to establish a 100% Tobacco-Free Policy. CoC, under the leadership of its director, Linda Early Brown, initiated this policy effort. The CoC is a statewide entity that educates communities of color about the dangers of tobacco use, secondhand smoke exposure and the availability of smoking cessation resources. The network’s regional coordinators, Hendrix Broussard; Urina Holt; LaTonya Owens and Frankie Poland, continue to lead the way in this endeavor statewide through educational workshops. The program is funded via a grant with the Louisiana Campaign for Tobacco-Free Living. In October 2012, CoC recommended the 100% Tobacco-Free Policy to the Southern University System (SUS) Board of Supervisors and it was approved with an effective date of January, 2013. This was approximately a year prior to the state mandate that all Louisiana colleges and universities adopt a similar tobacco policy effective August 1, 2014. According to the policy, the use of tobacco products on any Southern University campus is prohibited by students, staff, faculty or visitors in campus buildings, facilities, or property owned or leased by the Southern University System and outside areas of the campus where non-smokers cannot avoid exposure to smoke; on campus grounds, facilities, or vehicles that are the property of the campus; and at lectures, conferences, meeting, and social and cultural events held on school property or school grounds. Further, the sale or free distribution of tobacco products, including merchandise on campus or at school events is prohibited. The Communities of Color Network extends congratulations to all SU Ag Center employees and thanks them for their continued efforts in assisting with the implementation of the 100% Tobacco-Free System Policy and encourages them to continue their efforts in making the System a place to live, learn, work, and play where healthier air for all is the norm. Baton Rouge, La. – Southern University Ag Center staff members Mila Berhane, Stephanie Elwood and Owusu Bandele (retired professor emeritus) are listed among the conference presenters for the 25th annual conference of the Southern Sustainable Agriculture Working Group (SWAG), Inc. 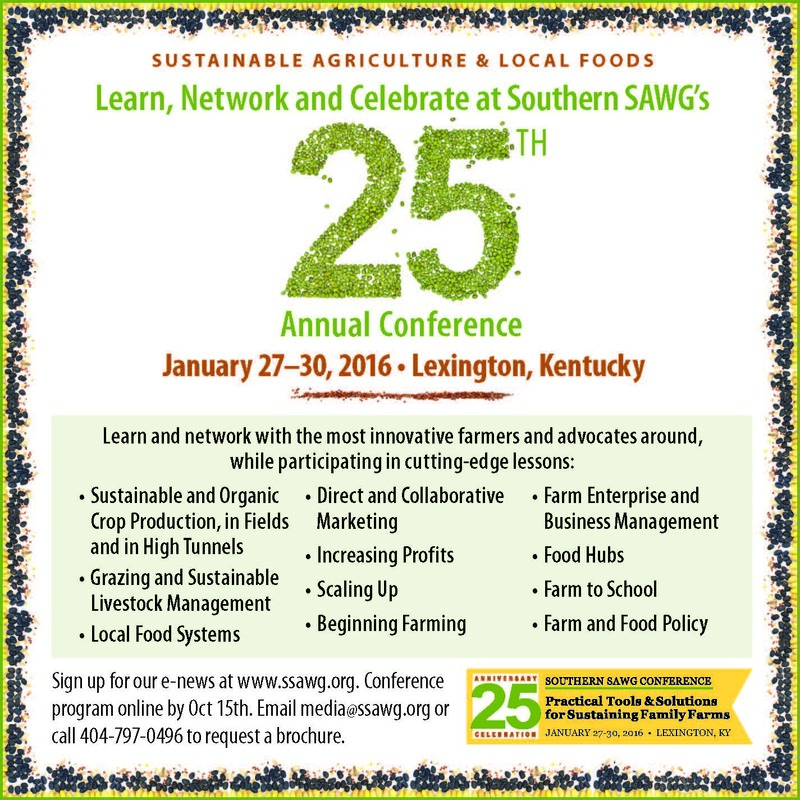 The conference, themed Practical Tools and Solutions for Sustaining Family Farms, will be held in Lexington, KY from Jan. 27-30, 2016. Both Berhane and Elwood will make a joint presentation on “Getting Great Starts,” which will discuss the best systems for growing transplants in heated tunnels or greenhouses. Berhane will also make a presentation on “Integrated Ecological Weed Management: Examples of Organic Farms in the South,” with experts from North Carolina and Georgia. Bandele will present during the Friday Edition of ‘Voices From the Field: The Everyday Work.’ This special event will feature individuals whose everyday work contributes to remarkable progress in the areas of sustainable, organic and/or local food movement. 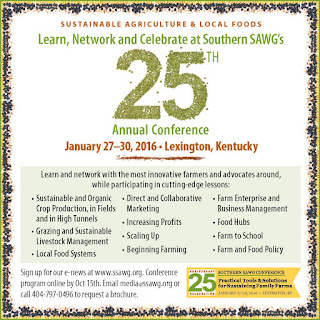 The Southern SWAG Conference provides practical tools and solutions for sustainable and organic farmers, as well as, creates more vibrant community food systems. The event is planning to draw more than 1,000 farmers and local food advocates from across the nation. Its’ mission is to empower and inspire farmers, individuals, and communities in the South to create an agricultural system that is ecologically sound, economically viable, socially just, and humane. For additional information about the conference, visit http://www.ssawg.org/. Photo of a strawberry plant suffering from crown rot. Baton Rouge, La. – Southern University Ag Center Agriculture and Natural Resources Agent Ahmad Robertson, Sr., along with state plant pathologists Drs. Raj Singh, Melanie Ivey and LSU Ag Center vegetable specialist Dr. Kiki Fontenot, recently visited several strawberry farms in St. Helena and Tangipahoa Parishes to assist farming operations suffering from crown, root and stem rots this winter. The specialist provided the farmers with an action plan with control recommendations for insect and disease management. Last year Southeast Louisiana received 12 inches of rainfall in late October. This excessive soaking after rain showers and storms can ruin a plants’ roots, which in turn affects how plants grow. 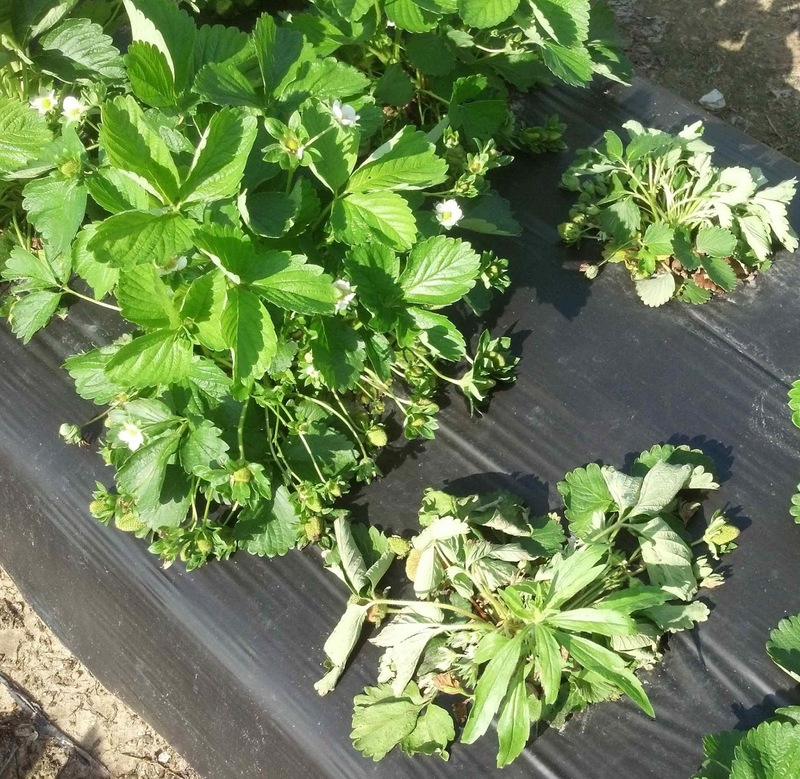 Strawberries are among the most challenging horticultural crops to grow in the South due to high levels of soil borne pathogens, such as phytophthora. When the soil becomes saturated with water, this pathogen can produce and release zoospores, which swim through water-filled pores to infect plant tissue. Infections can occur during cool to moderate temperatures, which are typical throughout Southeast Louisiana fruit and vegetable production cycles. Symptoms of phytophthora usually begin in the upper part of the plant's crown and spread downward. The youngest leaves wilt suddenly and often turn a bluish green color. Wilting spreads quickly throughout the plant, and complete collapse occurs within days. When infected plants are cut open, a brown discoloration can be seen in the crown's vascular tissue or throughout the crown's tissue. The pathogen can be controlled in production fields by using soil fumigation and good cultural practices. These practices include the use of certified transplants, avoiding poorly drained soils, and preparing fields to provide good soil drainage during wet weather. Good surface drainage is absolutely necessary for a successful vegetable garden. Water standing in the garden for long periods of time is fatal to the growth of vegetables. Low and wet areas can be improved by adding eight inch layers of top soil (two-three yards of topsoil per 100 square feet) to raise the garden site. Also make sure to put in drains to carry water away from the garden and plant crops on high rows. All vegetable crops in Louisiana should be grown on raised beds at least 10 inches high. High rows encourage good drainage, especially during times of heavy rains. Use raised beds and carefully managed drip irrigation; plant in non-infested soils that have good drainage. Soil solarization has been shown to be effective for the control of soil borne pathogens and weeds. Solarization is a method of using the natural energy of the sun to sufficiently heat the soil to temperatures high enough to kill many soil pests. To use this method, a clear plastic tarp is used to cover the soil, trapping heat beneath it. Pests that may be killed during solarization includes nematodes, plant diseases, and weeds. Most nematodes are killed when the soil temperature goes above 118 degrees. The hottest months, June, July, and August, are the best times for solarization. Adequate moisture should be present in the soil to irrigate it, if necessary before treating. If conditions are dry it’s advisable to run some type of irrigation or soaker hose under the plastic to water the soil during the course of the treatment. The plastic tarp should be left on the area for eight weeks. Commercial farmers should use fungicides, such as Ridomil Gold SL or Aliette WDG, to manage crown rots. Begin a fungicide application at the first sign of disease and repeat applications according to the product’s directions. Maintaining good sanitation of planting beds, inspecting plants, handling plants carefully, using crop rotation and planting resistant cultivars are great practices for disease management. For more information, contact Ahmad Robertson, Sr. in the Tangipahoa Parish Extension Office at 985.748.9381, or in the St. Helena Parish Extension Office at 225.222.4136. Kentwood High Magnet School O.M.G. Club members use visual materials to complete their individual vision boards, which represent their personal goals for 2016. Kentwood, La. – On Wednesday, January 20th the Southern University Ag Center hosted a Vision Board Party for the Outstanding Mature Girlz (O.M.G.) Club at Kentwood High Magnet School. There were 40 young ladies in attendance, anxiously waiting to create a visual of positive affirmations that reflected their personal goals for 2016. Vision boards are visual representations of what an individual envisions for their life. Individuals are encourage to use personal photos or visual materials to define their year-long aspirations and goals. “I was really excited to see so many young ladies not only include college on their vision boards, but they were also cutting out magazine clippings that represented our beloved Southern University,” said SU Ag Center’s Assistant Area Agent, Nicolette Gordon. After the club members completed their vision boards they were instructed to hang their boards in a place where they could view their dreams and aspirations daily. The next vision board party is scheduled to take place at St. Helena College & Career Academy in February. For more information about the O.M.G. Club, contact Nicolette Gordon in the Tangipahoa Parish Extension Office at 985.748.9381, or in the St. Helena Parish Extension Office at 225.222.4136. 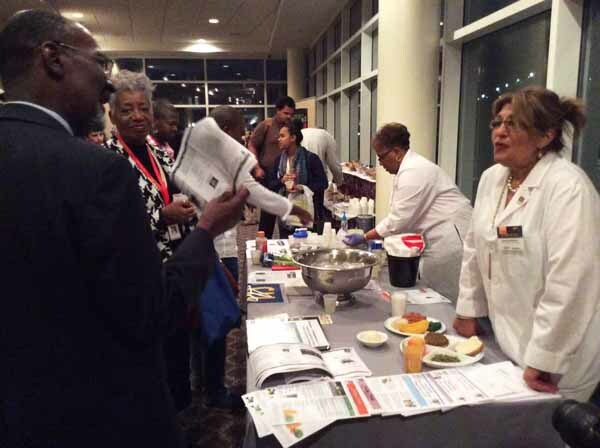 Fatemeh Malekian, Professor, Nutrition Sciences and Kasundra Cyrus, Extension Specialist/Family and Human Development attended the 73rd Annual Professional Agricultural Workers Conference (PAWC) which was held on December 6-8, 2015 at the Kellogg Conference Center, Tuskegee University. The SU Ag Center participants made a PowerPoint presentation titled "Effect of Whey Protein/Resistant Starch on Body Weight" and a poster presentation in conjunction with shake/smoothie preparation demonstration. The conference was themed: “Beyond the Veil – Agriculture, Families and Communities of the Future: Local, National, and Global Perspectives"
The Professional Agricultural Workers Conference is a forum committed to a world that values and promotes equal opportunity equitable access to information and technology for sustainable development of communities and natural resources. The conference began in 1942 mainly with Tuskegee University and local and state support and participation. It is now national in scope including representatives from the national land grant community, and from the state, federal, and private sectors. The 2015 PAWC will be held in December 6th to 8th at the Kellogg Conference Center, Tuskegee University. SU Ag Center Area Agent for St. Helena and Tangipahoa Parishes, Ahmad Robertson (pictured on the left in a black jacket), analyzes strawberries with Tangipahoa grower Frank Arnoe during a recent farm visit. Baton Rouge, La. – To have a rich strawberry harvest in the spring, the berries should be well protected against frost. With this season’s plunging overnight temperatures, it is important to consider implementing a freeze protection plan for your strawberry buds and blossoms. Temperature control is important during the winter and early spring when the flowers are susceptible to frost. Tangipahoa growers aren’t taking any chances as they have an action plan of laying out row covers this winter. During recent farm visits with LSU Ag Center Specialists, Drs. Raj Singh and Kiki Fontenot, we learned how commercial vegetable producers such as the Liuazza’s, Faust’s, Mendez’s, Arnoe’s, Capace’s, and Holmes are protecting their crops and using integrated pest and disease management practices. Strawberries are grown annually in Louisiana and have been an important horticulture crop for centuries. Both Tangipahoa and Livingston Parishes are traditional commercial production areas for the crop. These commercial growers started harvesting their berries in Mid-November. Production usually slows up during the winter and peaks again in March and April, just in time for the annual Ponchatoula Strawberry Festival. · Place row covers, made of light polypropene fabric, directly on top of the plants to protect the fruit and blooms from frost. The heavier the cover, the more protection they will provide. The covers work by trapping heat during the day, which promotes plant development and earlier harvest. The covers should be removed during the day when temperature rises above 40 degrees to allow pollination, pest control, and prevention of leaf scorch. · Black plastic and pine straw mulch are also great management practices that can be used on a farm operation. · Also plan ahead to manage cold injury risk and obtain reliable weather forecast with necessary parameters. During one of the farm visits, Tangipahoa growers Mr. Frank Arnoe and Guy Capace, reminisced about the how they used sprinklers in the late 80’s and mid 90’s to protect their crop and having to stay up all night to monitor their berries. The practice of using sprinklers as a method of freeze protection is effective, but it must be used correctly. The idea is to slowly build ice over the plant or row covers during the period when temperatures are below freezing. As ice is formed some heat is released to the plant's surface and the surrounding air, due to fusion. To do this, sprinklers must be turned on before temperatures are at 34-35 degrees. Use low volume sprinklers to apply irrigation throughout the night to build an ice cover over the plants. The farmers said they were happy when row covers (what they referred to as new technology) was available to purchase and improved their production. Below are some freeze terms and information on what can happen to plants if they are not protected. Freeze Terms What happens without protection? For additional information, contact the St. Helena or Tangipahoa Parish Extension Service Offices by calling (985) 748-5462, (225) 222-4136, or email ahmad_robertson@suagcenter.com. 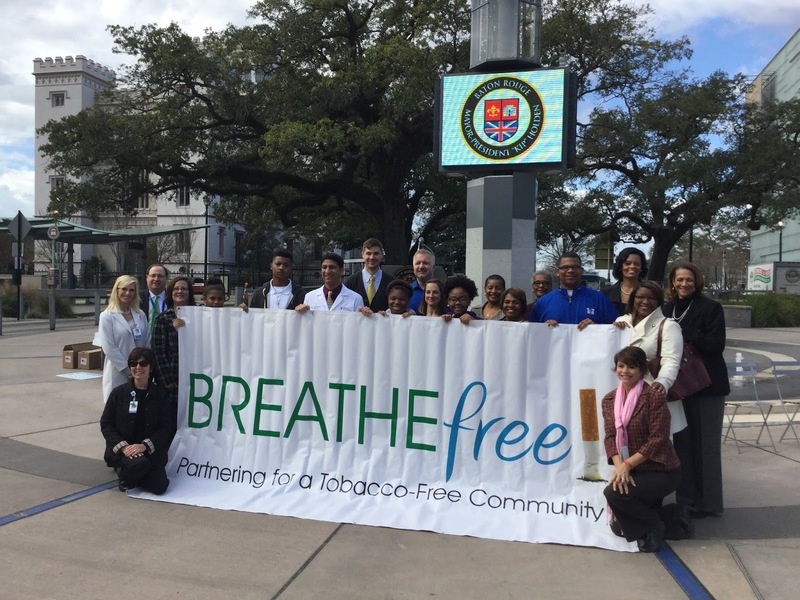 Pictured are partners of the 2016 Breathe Free campaign following the Breathe Free Press Conference on January 20 in the Galvez Plaza of Downtown Baton Rouge. Baton Rouge, La. 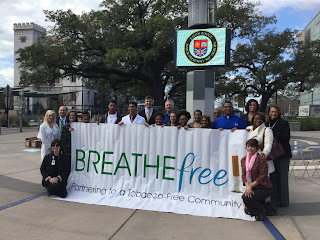 – In partnership with local health agencies, the Southern University Ag Center’s Communities of Color Network Director, Linda Early Brown and Regional Coordinator, Frankie Poland participated in the Breathe Free Press Conference on Wednesday, January 20th, to announce the 2016 “Breathe Free” campaign. The event was held in Galvez Plaza in Downtown Baton Rouge. Baton Rouge, La. – Southern University Ag Center Agriculture and Natural Resources Agents Ahmad Robertson, Sr. and DeLane Ross held a gardening workshop for women incarcerated at the Louisiana Correctional Institute for Women (L.C. I. W.) in St. Gabriel, LA on Dec. 11, 2015. During the workshop, Robertson, an area agent in St. Helena Parish, facilitated a presentation on ‘Backyard Fruit Production.’ This presentation provided the facility’s trustees with knowledge on proper planting methods, pruning, diseases, pest control, conventional and organic growing practices, variety selection and cultural tips for specific fruits grown in Southeast Louisiana. Ross, who is an agent for St. Martin and Iberia Parishes, gave a presentation on ‘Improving Soil Health to Improve Plant Health,’ which helped to foster the knowledge and science of maintaining soil and its direct effect on plant health. Participants were excited to learn about the types of fruits they were able to grow within the institution’s current landscape. They were also intrigued to learn the vital importance of balancing soil nutrients along with maintaining a proper pH to produce optimum growing conditions. Most of the participants stated that they will put the knowledge and skills learned from the prison’s horticulture program to use once they leave L.C.I.W. Many said they believe the hands-on trainings and certifications received from their horticulture class will enable them to find employment in the landscaping and greenhouse industry. The SU Ag Center will continue to provide horticultural programs for incarcerated adults and youth in an effort to offer science, education, job training, conservation projects, and sustainable operations to corrections facilities across Louisiana. This workshop was made possible through a partnership with Willie Sims, a Baton Rouge Community College Horticulture Instructor who works within the incarcerated trustee communities. Southern University interim Chancellor Dr. Adell Brown, Jr. speaks with U.S. 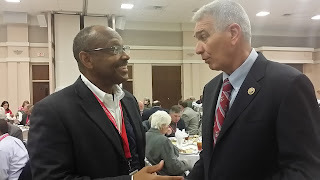 Congressman Ralph Abraham, 5th District of Louisiana, during the North Louisiana Agri-Business Council's Agricultural Award and Legislative Appreciation Luncheon on Jan. 15 in Monroe, LA. Baton Rouge, La. – Southern University Ag Center interim Chancellor Dr. Adell Brown, Jr. attended the North Louisiana Agri-Business Council’s Agricultural Award and Legislative Appreciation Luncheon on Jan. 15 in Monroe, LA. While there, Dr. Brown was able to speak with U.S. Congressman Ralph Abraham, who represents the 5th District of Louisiana. The luncheon, which honors legislators and regional leaders in agricultural production, service and business, is one of several events held during the annual AG EXPO. SU Ag Center interim Chancellor Dr. Adell Brown, Jr., Vice Chancellor for Extension Dr. Gina E. Eubanks, along with members of the SU Ag Center and the SUBR's College of Sciences and Agriculture, discuss ways to enhance their relations during a meeting held at the SU Ag Center on Jan. 14. Baton Rouge, La. 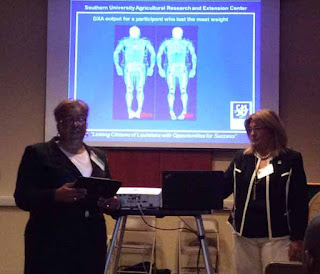 – Officials from the United States Department of Agriculture’s (USDA) Louisiana office visited the Southern University Agricultural Research and Extension Center on Jan. 14. SU Ag Center’s interim Chancellor Dr. Adell Brown, Jr., Vice Chancellor for Extension Dr. Gina E. Eubanks, along with several faculty and staff of the SU Ag Center and professors from the Southern University Baton Rouge campus’ College of Sciences and Agriculture, met with Kevin Norton, the state’s USDA Natural Resources Conservation Service (NRCS) Program Liaison; Randolph Joseph, NRCS State Conservationist; Craig McCain, Louisiana’s Executive Director of the USDA’s Farm Service Agency (FSA) and Christine Normand, FSA’s Administrative Chief during the visit. The group held a round table discussion which focused on enhancing the relationship with both the NRCS and FAS by realigning programs to help the state’s clientele and provide more opportunities for students in the field of agriculture. The Southern University Ag Center and the SUBR’s College of Sciences and Agriculture will continue to work with the USDA to enhance economic opportunities, provide highly competitive agricultural systems and help the citizens of Louisiana become a healthier, more nourished population. 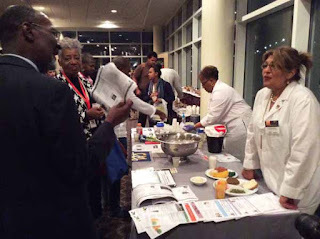 Dr. Fatemeh Malekian, standing in a white coat, talks to participants during the shake/ smoothie demonstration while Dr. Kasundra Cyrus, standing in the background, prepares shakes during the Professional Agricultural Workers Conference at Tuskegee University. Baton Rouge, La. – Southern University Ag Center staff members Drs. 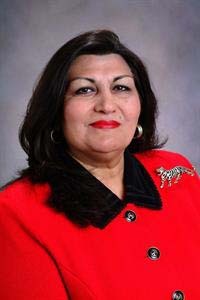 Fatemeh Malekian, Professor of Nutrition and Food Science; Kasundra Cyrus, Extension Specialist for Family and Human Development and Renita Marshall, Associate Professor of Animal Science were among the featured speakers during the 73rd Annual Professional Agricultural Workers Conference (PAWC) held at Tuskegee University, December 6th – 8th. 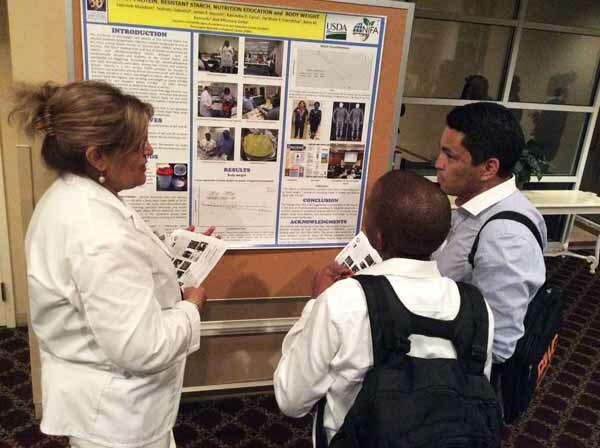 During the conference, Malekian and Cyrus presented a PowerPoint presentation titled “Effect of Whey Protein/Resistant Starch on Body Weight” and conducted a poster presentation in conjunction with a shake/smoothie demonstration. Marshall presented a presentation titled, “Evaluation of Herd Health Programs and Management Practices on Small Beef Cattle Farm Operations: A Case for Prevention vs Treatment,” during the Livestock Research and Outreach session of the conference. Additional information on Whey Protein can be obtained by visiting, goo.gl/akNEhx. For information on the PAWC visit, www.PAWC.info. Baton Rouge, La. – Nutrition agents in Calcasieu Parish with the Southern University and LSU Ag Centers have been awarded a Walmart Community Health and Wellness Initiative grant by the Walmart Foundation. Southern Ag Center’s Carol Sensley and LSU AgCenter’s Shatonia McCarty will be presented with the award on Wednesday, January 20, 2016 at 7 a.m. during the grand opening of a Walmart Neighborhood Store on Ryan Street in Lake Charles, LA for their work with the Creating, Healthy, Enjoyable Foods (C.H.E.F.) 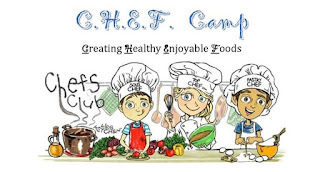 Cooking Camps. The C.H.E.F. Camps are designed to teach youth basic cooking principles and nutrition education based on the USDA’s “MyPlate” food guidance system and the 2010 Dietary Guidelines. Each day, participants work together to create an entire meal while learning healthy eating and physical activity principles, food preparation, kitchen and food safety, common cooking terms, proper food handling, measuring techniques, critical thinking and team building skills, planning and time management. During the summer of 2015, Mrs. McCarty and Mrs. Sensley conducted three cooking camps throughout the Lake Charles community at the Throne of Grace Fellowship, Zion Tabernacle Church and with the Sickle Cell Foundation. It was the camp conducted at the Throne of Grace Fellowship that caught the attention of church member and Walmart Store Manager, Tiffany Johnson. Therefore producing the grant opportunity. The funds awarded through the grant will provide support to community outreach to promote health and wellness among Lake Charles residents. During the store's grand opening, Sensley & McCarty will conduct food demonstrations and provide nutrition information. SU Ag Center interim Chancellor Dr. Adell Brown, Jr. leads employees on a mile and a half walk around A.O. Williams Hall as part of the Center's, 'Looking Good, Feeling Great,' employee Health Initiative. Baton Rouge, La. 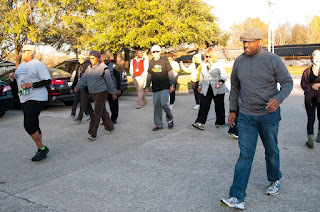 – Several members of the Southern University Ag Center’s state office swapped their dress shoes for sneakers on Wednesday, Jan. 6 as interim Chancellor Dr. Adell Brown, Jr. led them on a mile and a half walk around the rear parking lot of A. O. Williams Hall. The group laced up their shoes as part of the Ag Center’s internal employee health initiative called, “Looking Good, Feeling Great,” which was launched on Monday, Jan. 4. The program, which is voluntary, has been developed and executed especially for all SU Ag Center employees, regardless of their location. Chancellor Brown and Dr. Gina E. Eubanks, SU Ag Center Vice Chancellor for Extension, will host a kick-off for the initiative at 11 a.m. on Tuesday, Jan. 12 in room 191 of A. O. Williams Hall. Participants will receive health journals, exercise accessories and challenge instructions during the event. Parish staff and other employees not located in the state office are encouraged to participate at their location and post photos of their activities on the SU Ag Center’s Facebook and Twitter pages using the hashtag, #SUAgCenterLGFG.